This beautiful holiday house is located in the holiday resort Kavran and is perfect for two families, who travel together and would like to stay as close as possible but still have their privacy. 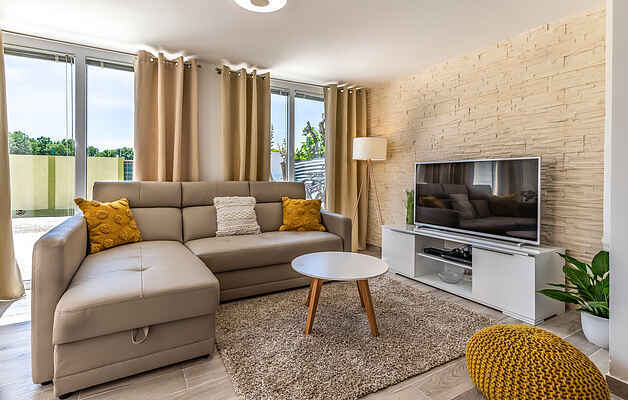 It consists of two completely equipped accommodations on two floors, which are connected by external stairs. From the living-room on the ground floor you can reach the terrace and further the swimming-pool. Only about ten minutes by car separate you from local beaches, with crystal clear sea. Discover hidden small bays, far away from noise and hustle. Visit the holiday resort Duga Uvala and many other excursion destinations.